Online syndication must leave all hyper links in my content active. Content may not be edited in any way without prior approval from the author. Online media must make these links active, and may not frame the visitors session to this blog. You may however, opt to open the link in a new browser window. You may not use any type of redirection to my site. This includes the use of "link transition ads", pop-ups, pop-unders, or other such invasive advertisements. Author must be paid for all media syndication. Rate is negotiable based on the amount of content per week that will be made available in each edition. Byline must remain in tact at the end of each syndication set, with a link(online) or printed web address to the main page of this blog (off line) regardless of media type. 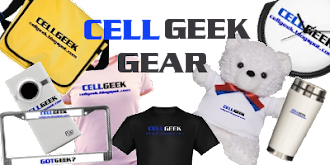 Media may not be archived in full on the any website other than the Cell Geek Blog located at http://cellgeek.blogspot.com. Upon agreement for syndication you will be provided with an embedded RSS feed for your web site.